heart·y adj. 4. b. Providing abundant nourishment; substantial: a hearty meal. I think Lorraine may have overstated the case here with her paella. 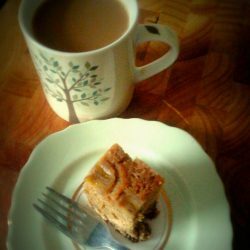 It’s certainly very pleasant, but not exactly abundant in nourishment. Of course, she might have meant the other meaning of hearty – a meal fit for a pirate (“avast, me hearties”) – but this would also be some way off the mark. It apparently serves 6, but even with a side salad, it was only really enough for 5 of us. It was very nice, and easy to cook, but wasn’t as exciting as I’d hoped. 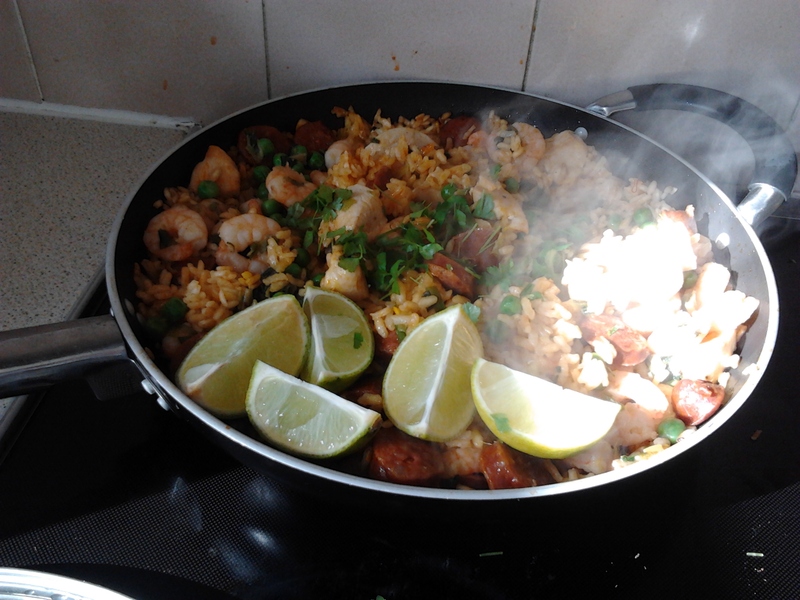 Lorraine says to cook in two pans – chicken, chorizo, rice, spices and stock go in one and cook for about 30 minutes. I think it actually takes more like 20 minutes for the rice to absorb the stock. Once this is cooked, she says to start on the other pan of spring onions, prawns and peas. But I was pushed for time so did it while the rice was cooking, and I don’t see why you shouldn’t. You then add the prawn mix to the rice mix and voila! Or, to be more authentically Spanish: ya está. 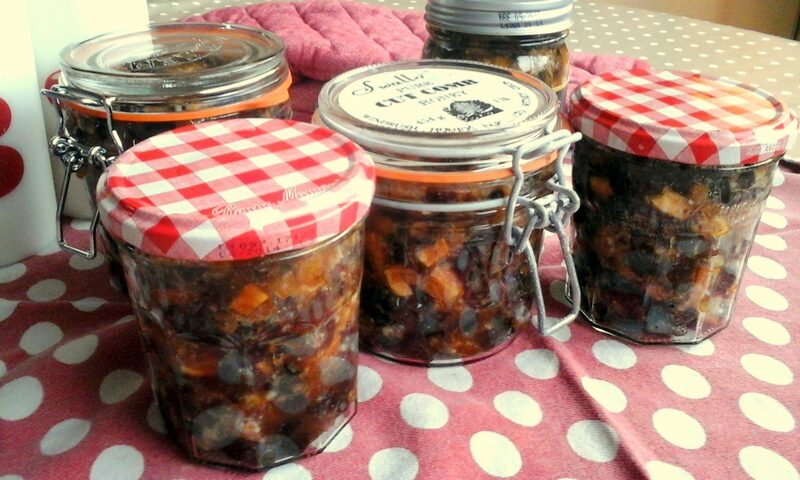 I used white wine in place of sherry, so I might try sherry in future to see what difference it makes. I might also add mussels and more garlic to give more of a wow factor. 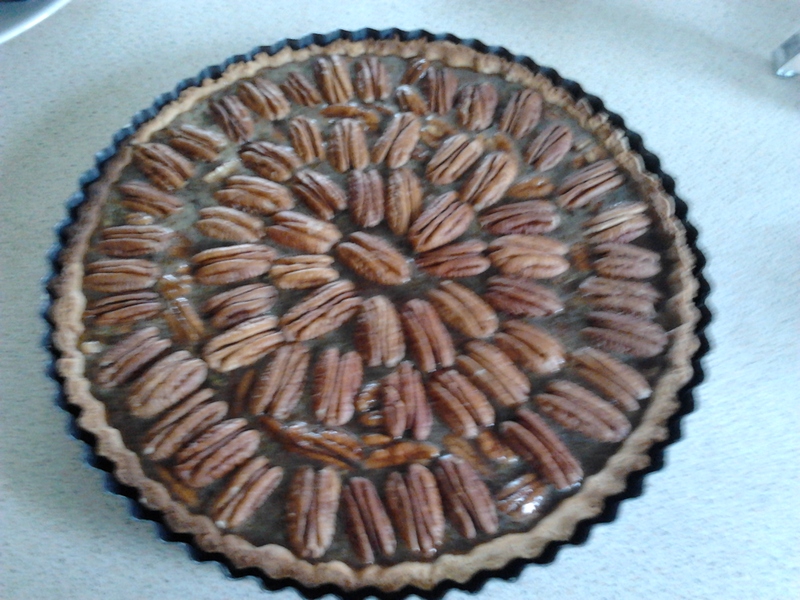 On the same day I also made the pecan pie, which was much more interesting! I made the pastry in the food processor which is so easy, I might make pastry all the time now. You then chill the pastry and roll it out to just under the thickness of a pound coin. So as this article helped me work out, that’s more like a £2 coin, or even better, a commemorative 25p coin, if you happen to have one lurking around the house. I failed to roll mine out thin enough, but I have resolved to try harder next time. 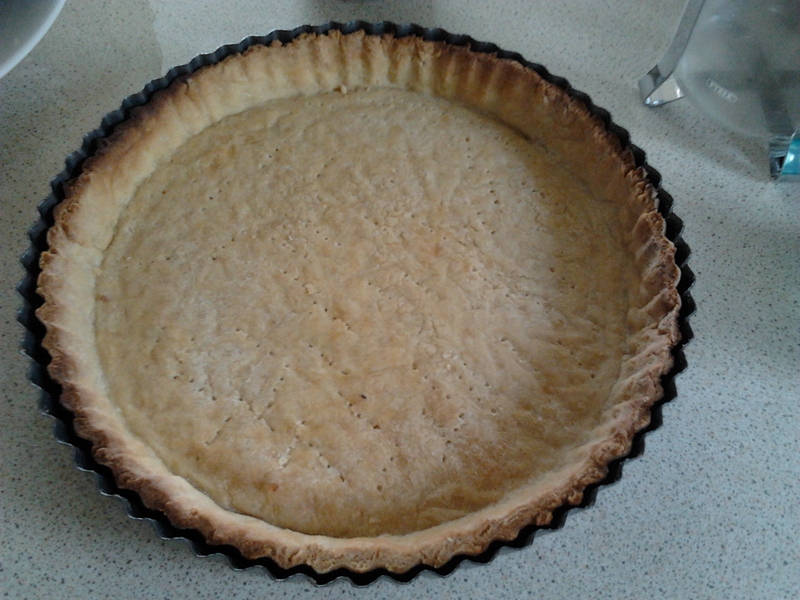 Put the lovely thin pastry into the pie dish, and get it into the edges. Use a small ball of dough to push the pastry, so you don’t put your fingers through it (Top Lorraine Tip!). 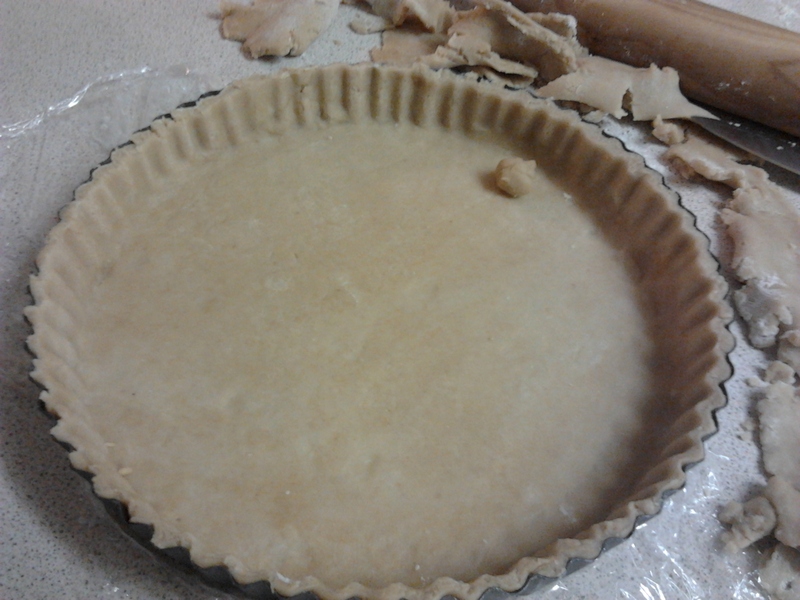 Then trim the pastry. Bake it in the oven under a layer of baking parchment and baking beans for about 30 minutes. Delia says you don’t need baking beans, but they are quite fun! 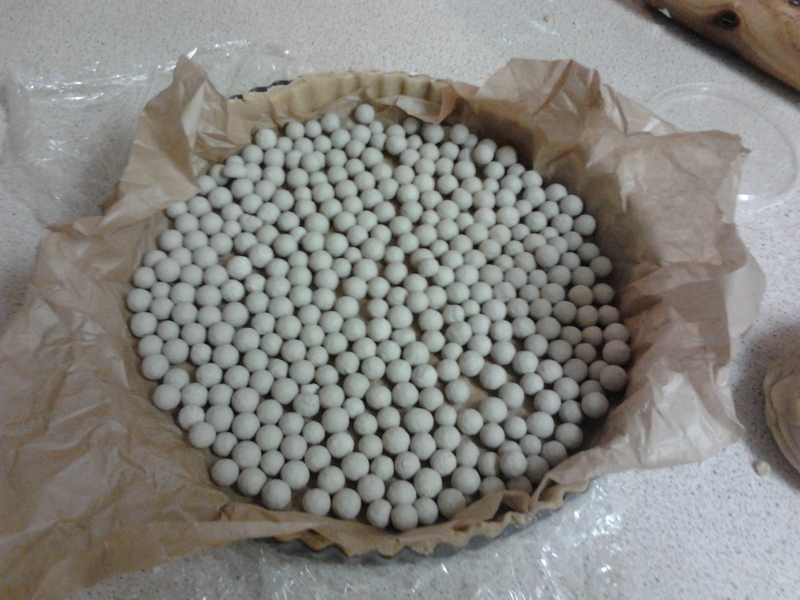 Let the cooked pastry case cool before filling. I did mine the day before. The filling is melted butter, brown sugar, golden syrup and eggs. 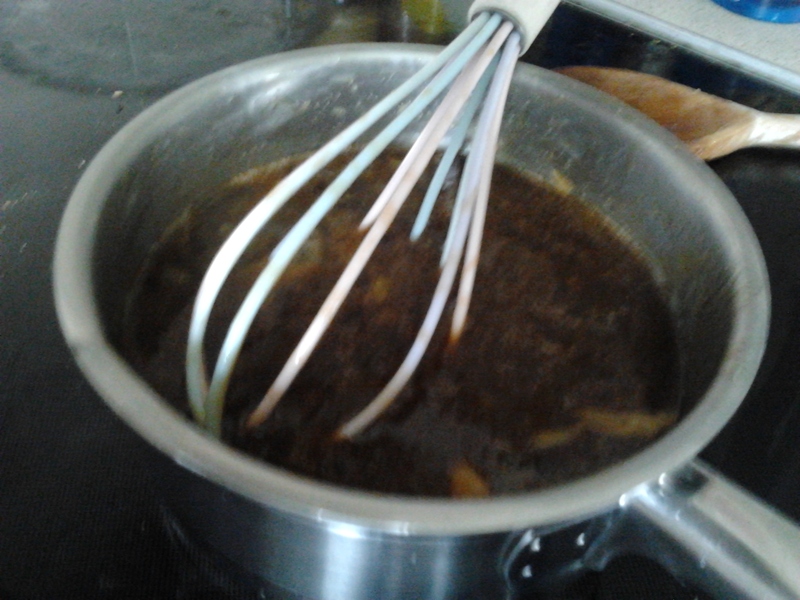 It’s quite gloopy and difficult to mix, but a whisk did the trick eventually. 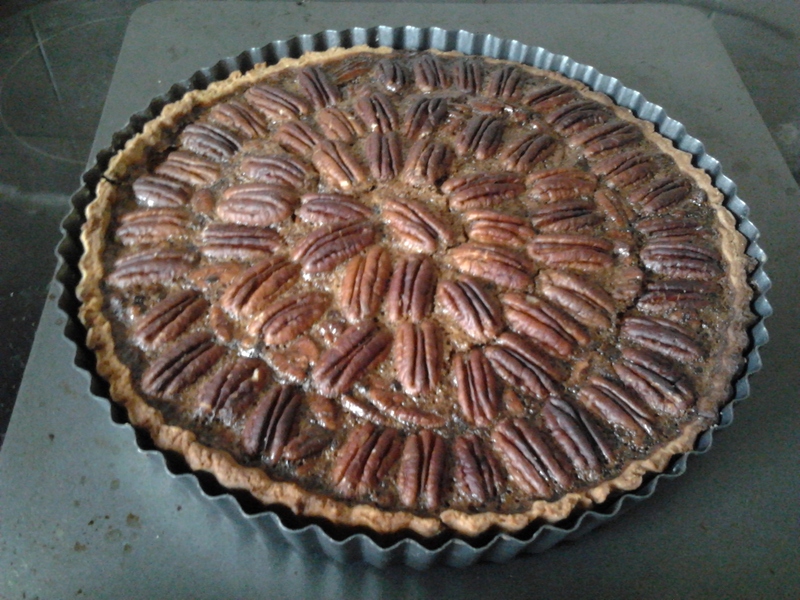 I then sorted the pecans from the packet – reserving whole ones for the topping and folding any broken ones into the mix, with which I then filled the tart. I arranged the whole pecans on top in mathematical fashion. I like to think it’s quite arty, and it makes cutting easy (“I’ll have 3 pecans width please”). It baked the oven for 40 minutes (longer than Lorraine said). I served it with ice cream. It was lovely and gooey, and not horrendously sweet which was my fear. This is definitely a recipe I’ll be making again. I have just watched a clip of this on youtube, classic!